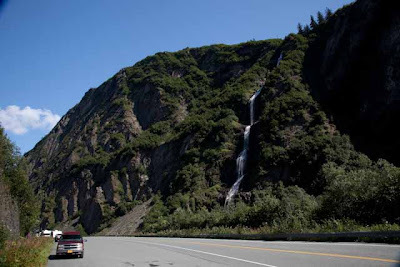 We arrived in Valdez Monday afternoon and booked ourselves into Bayside RV for two nights. $33/night for 50 amp, full hookups with free cable and internet. The drive in from Glenallen along the Richardson Highway was very scenic, especially Keystone Canyon. There were waterfalls and glaciers everywhere we looked. 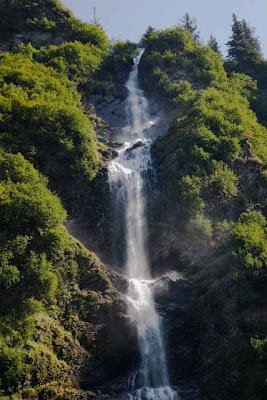 Here is a couple of shots of Bridal Veil Falls. We’ll be on our way out to Tok on Wednesday. Valdez is a quaint little village right on the coast of Alaska. Salmon are spawning in Crooked Creek. We saw pink and chum salmon battling their way upstream to spawn and die. Kind of sad really. Jim and I thought about doing a half day fishing charter in Valdez but today’s weather is rather moist, so we passed. Enjoying a quiet afternoon catching up on emails, etc. Chris is making fish and chips for supper. This entry was posted in Alaska, Photography.